Transpiration is a term used for the release and evaporation of water from all plants including trees that is released out and into the Earth's atmosphere. Nearly 90% of this water exits the tree in the form of vapor through small pores called stomata on leaves. The leaf cuticle covering located on the surface of leaves and corky lenticels located on the surface of stems also provide some moisture. The stomata are also specially designed to allow carbon dioxide gas to exchange from air to assist in photosynthesis that then creates the fuel for growth. The forest woody plant locks up carbon-based cellular tissue growth while releasing residual oxygen. Forests surrender large volumes of water into the earth's atmosphere from all vascular plant leaves and stem. Leaf transpiration is the main source of evapotranspiration from forests and, at some cost during dry years, give up much of its valuable water to the Earth's atmosphere. Leaf stomata - microscopic openings on the surfaces of plant leaves that allow for the easy passage of water vapor, carbon dioxide, and oxygen. Leaf cuticle - a protecting film covering the epidermis or skin of leaves, young shoots, and other aerial plant organs. Lenticels - a small cork pore, or narrow line, on the surface of woody plant stems. In addition to cooling forests and the organisms within them, transpiration also helps to cause a massive flow of mineral nutrients and water from the roots to the shoots. This movement of water is caused by a decrease in hydrostatic (water) pressure throughout a forest's canopy. This pressure difference is mainly caused by water endlessly evaporating from the tree leaf stomata into the atmosphere. Transpiration from forest trees is essentially the evaporation of water vapors from plant leaves and stems. Evapotranspiration is another important part of the water cycle of which forests play a major role. Evapotranspiration is the collective evaporation of plant transpiration from the Earth's land and sea surface into the atmosphere. Evaporation accounts for the movement of water to the air from sources such as the soil, canopy interception, and waterbodies. Transpiration also includes a process called guttation, which is the loss of water dripping off uninjured leaf margins of the plant but plays a minor role in transpiration. The combination of plant transpiration (10%) and the evaporation from all bodies of water to include the oceans (90%) is responsible for all of the earth's atmospheric moisture. 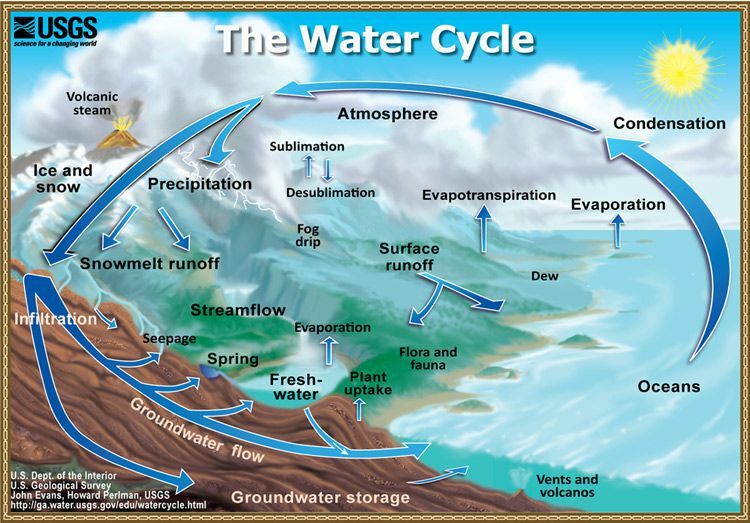 The interchange of water between air, land and the sea, and between organisms living in their environment is accomplished through "the water cycle". Since the Earth's water cycle is a loop of occurring events, there can be no starting or ending point. So, we can start learning about the process by beginning where most water exists - with the sea. The driving mechanism of the water cycle is ever-present solar heat (from the sun) which warms the waters of the world. This spontaneous cycle of naturally occurring events creates an effect that can be diagrammed as a spinning loop. 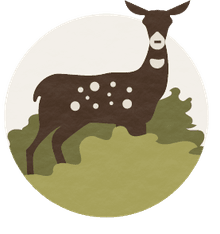 The process involves evaporation, transpiration, cloud formation, precipitation, surface water runoff, and the percolation of water into the soil. Water at the sea's surface evaporates as vapor into the atmosphere on rising air currents where the resulting cooler temperatures cause it to condense into clouds. Air currents then move clouds and particulate materials which collide continuing to grow and eventually falling out of the sky as precipitation. Some precipitation in the form of snow can accumulate in polar regions, stored as frozen water and locked up for long periods. Annual snowfall in temperate regions will usually thaw and melt as spring returns and that water returns to fill rivers, lakes or soaks into the soil. Most precipitation falling onto land will, due to gravity, either percolate into the soil or will flow over the ground as surface runoff. As with snow-melt, surface runoff enters rivers in valleys in the landscape with streamflow moving water towards the oceans. There is also groundwater seepage that will accumulate and is stored as freshwater in aquifers. The series of precipitation and evaporation continually repeats itself and becomes a closed system.